Newfoundland is already an island off the edge of a continent – and on this journey we get you even further out there. You’ll explore the wild Atlantic east coast, and visit Fogo Island, a unique ‘outport’ off the northeast coast of Newfoundland. On Fogo the locals claim not four but seven seasons: a warm Summer (July & August); a snowy Winter (Dec-Feb); Pack Ice Season (March); a hopeful Spring (April-May); Trap Berth Season in June, (neither spring nor summer, marking the traditional start of the cod fishing season); Berry Picking Season (Sept & Oct); and a stormy and emotional Late Autumn in November. 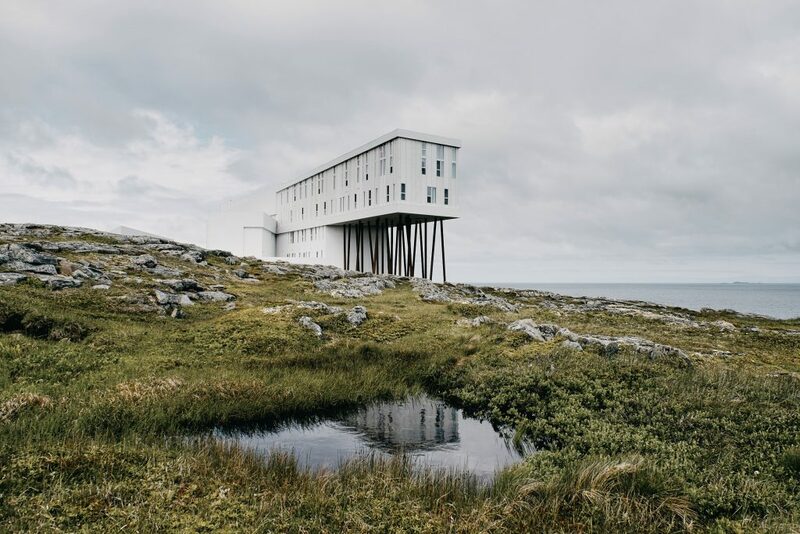 All offer their own unique opportunity to enjoy the hospitality of the famous Fogo Island Inn. Experience wild coastal scenery with whales, puffins and icebergs during the day; and in the evenings cozy up in a pub with good food, traditional music and tall stories from the locals in St John’s or Trinity. From sea kayaking, to historic tours; from guided nature walks to relaxing boat trips this journey includes a choice of activities to suit most people. One of the oldest cities in North America, St. John’s has fascinating haunts and hidden gems, and is a culinary destination. With the highest concentration of pubs per capita on the continent, a visit to St. John’s isn’t complete without a visit to George Street! We've included an unlimited pass to Canada’s national parks, national marine conservation areas and national historic sites. Overnight at the Murray Premises Hotel. Your hotel was built in 1846, and is the oldest of the collection of mercantile buildings located in a National Historic Site on the St. John's waterfront. Rooms radiate character through exposed 19th century wooden beams, contemporary furnishings and luxurious touches. You'll be just minutes walking distance from restaurants, quaint shops, and Mile One Centre. Travel south along the Avalon Peninsula to explore the beautiful, rugged and wild coastline. See countless natural wonders comprised of stunning cliffs, sea caves, and waterfalls. Keep your eyes open for puffins, humpback and minke whales. After a serene 30-minute walk along a natural isthmus surrounded by the sea, enjoy an award-winning homemade picnic at beautiful Ferryland Head lighthouse (available Wednesdays through Sundays). Discover Newfoundland's culture and history on a half day guided tour. Walk through Cape Spear National Historic Site, then visit the oldest standing light house in North America. Other stops include Quidi Vidi Village, Government House, and the shops and restaurants of downtown St. John's. Cruise through the spectacular coastal vistas of Witless Bay Ecological Reserve, in search of whales and puffins. Enjoy live interpretation interspersed with a colourful mix of local humour, stories and song. Discover hidden caves, waterfalls, and wildlife along the beautiful Avalon coastline. With your private guide, you'll have the chance to see puffins, whales, and in the early season – icebergs. Depart St. John’s along the scenic Conception Bay coastal drive – on a clear day you will be able to see the still active Bell Island Lighthouse. Make your way northeast to the Bonavista Peninsula and onto the cultural capital of Newfoundland – Trinity. You have a reservation at Twine Loft Restaurant inside the Artisan Inn. Recommended in “Where to Eat Canada,” you’ll have a three-course set menu prepared by local chefs using only the freshest ingredients and seafood. Overnight at the Artisan Inn. Your accommodation is located in beautiful Trinity. The Inn features shorefront accommodations all within walking distance of each other. Twine Loft is the focal point of the Artisan Inn and includes the registration and lounge area, a seaside open-deck, and a casual fine-dining restaurant. Enjoy a delicious meal, relax on the deck, and soak in the beautiful ocean-side surroundings. Enjoy your choice of guided activity to explore the Bonavista Peninsula today. Then we recommend you hike one of Bonavista’s most scenic trails – the Skerwink, or visit the filming locations of The Shipping News and Random Passage. Discover Newfoundland's culture with the Rising Tide Theatre, performed by the Province's most talented artists in a magnificent setting. We have arranged delicious dinner in Trinity for you tonight at one of the best restaurants in town! Learn to identify fin, humpback, sperm, minke, and pilot whales, as they play and migrate through a scientific study area of the Bonavista Peninsula. Keep your eyes open for species of porpoises, eagles and offshore sea birds including puffins and northern gannets. Learn about Newfoundland's historic cod fishery, as you cruise past enchanting and long-abandoned communities of Trinity Bay. Listen to your captain's first-hand stories to a backdrop of natural beauty and wildlife. Depart Trinity and drive to the rugged and wild Fogo Island and its tiny historic fishing villages. Dinner this evening is in the vaulted-ceiling dining room, offering vistas of sunsets, storms, and icebergs. Enjoy creative cuisine inspired by local ingredients during your stay. Overnight at the Fogo Island Inn. A feat of contemporary design, this property is perched atop jagged rocks on the rugged coast of north Fogo Island. The Inn features 5 star luxury whilst incorporating the area's rich history, culture, and artisans. Suites are individually designed, featuring heated wood floors, custom-made furniture, hand-crafted quilts and floor-to-ceiling windows with North Atlantic views. The dining room features floor to ceiling windows, with views of the crashing surf. There's a modern art gallery and a cinema, plus a gym and a sauna. Explore this isolated and beautiful island. The wild landscape has caribou to track, hills of berries to forage, and a fascinating cultural backdrop. Discover Fogo's spectacular coastal hiking trails, go beachcombing, or take out a mountain bike today. The Island is home to a resident herd of caribou, and you may also see puffins and whales. Make sure to keep an eye out for icebergs in early to mid summer. Continue to explore Fogo Island at your leisure today. Today you could visit Little Fogo Islands - a tiny archipelago dotted with traditional wooden houses, tour one of the local museums, or take in the thriving arts and crafts scene. Watch fishermen catching cod, or ask about programs running at the Inn. Say goodbye to Fogo Island, as you return to the mainland. The drive back to St. John’s will take you a good part of the day, so be sure to go for a relaxing and celebratory farewell dinner on your last evening in St. John’s. Say goodbye to Newfoundland as you make your way home today. Friendly and dedicated Fresh Tracks Canada customer service – from the time you book, you are assigned your own personal Vacation Coordinator whom you can reach out to with any questions or requests. Witless Bay Cruise: Whales are most frequently spotted from mid-June to mid-August. Sightings outside of this window are considered a bonus. Icebergs are typically present in May and June. This trip is available for departures between May and September. based on double occupancy, May 2019 departure and our base class.